We don't normally think of making a fresh fruit salad in winter, but think again. You can usually find fresh pineapple, oranges, grapefruit, apples, bananas, pears (and pomegranates) in the produce department. 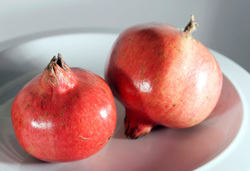 Pomegranates have a very limited season (mid-fall through January), which makes them all the more special. So celebrate the winter solstice with this beautiful, tart fruit salad, adorned with glistening, scarlet pomegranate seeds! NOTE: These days you can often find fresh summer fruit in the market in winter. It's generally been imported from the southern hemisphere, which has opposite seasons. If you don't mind paying the price and using this non-local, "shipped and handled" (and usually non-organic) fruit, go ahead. This is up to you. Please note that this is more of a road map than an actual, specific recipe. Proceed intuitively. Juice some of the pomegranates, and seed the others, placing seeds and juice in a bowl. Stir in the pineapple and citrus sections, including all the juices. Slice and add apples, pears, and/or bananas just before serving, so they won't discolor or wilt.